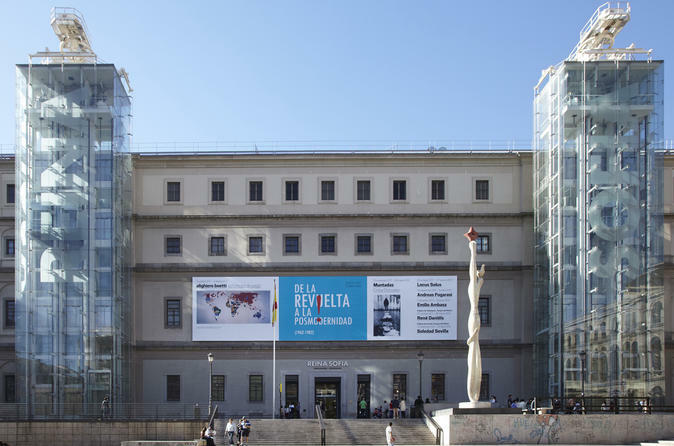 While you are in Madrid, don't miss the chance to visit Spain’s national museum, Reina Sofia. On a 1.5-hour guided tour led by an art historian, explore the highlights of this museum including the collections of Spain's two greatest 20th century masters, Pablo Picasso and Salvador Dalí. Stand in front of the most famous masterpiece in the museum, Picasso's painting 'El Guernica.' Discover the history behind the paintings of the modern period. Tour is conducted in English and Spanish, with a maximum group size of 30 people. At 12:45pm, meet your art historian guide next to the statue located outside the main entrance of the museum. Housed in an elegant old hospital building next to the Atocha railway station, the Reina Sofía boast over 21,000 works. The Reina Sofía's vaulted hallways are the ideal place to discover many of Spain’s finest artists and sculptors. Your guide will explain some of 20th-century Spanish art, from abstractionism to cubism, and surrealism to modernism, showing you the most important work of artists like Picasso, Juan Gris, Dalí and Joan Miró. International artists are not heavily represented in the collection, but there are works by Pierre Bonnard, Vasily Kandinsky or Diego Rivera. Along with this extensive collection, the museum also offers a mixture of national and international temporary exhibitions in its many galleries. Explore the hallways and galleries with your guide, and learn how and why these talented people created their art. The tour will end at approximately 2pm at the museum, but you are free to linger longer inside if you wish.